Cute and furry toys Zhu Zhu Pets have become a hit amongst the little ones. 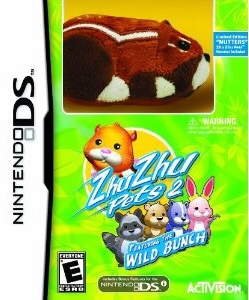 In their second appearance on the Nintendo DS, the adorable Zhu Zhu Pets hamsters find themselves being challenged by the mischievous Wild Bunch - another adorable bunch of little critters that could pass as anything but mischievous! 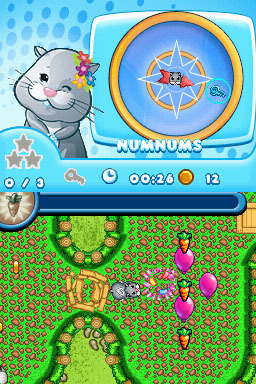 The gameplay is separated between adventuring and nurturing the pets. 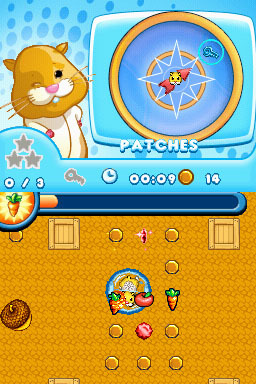 Initially, you pick one hamster as your "main character" but as you progress, you get to play and nurture other hamsters. 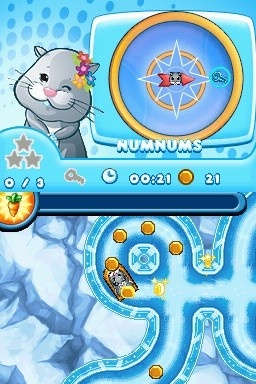 During Adventure Mode, you will tap the plane icon to travel to an unclouded area. 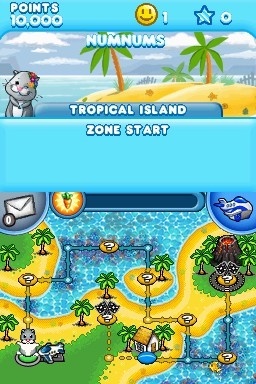 There will only be one spot to go in the beginning, but the clouds will disappear and reveal other places to go when you win the final race for a particular area. 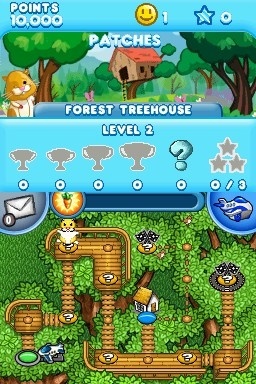 The differently themed adventure worlds (treetops, snowy slopes, beach, caves, etc.) are presented a bit like a board game, with certain markers leading to a new adventure zone. 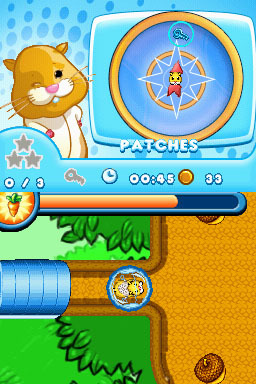 These zones are a bit like mazes, where you hamster will roam around collecting items and finding a key to eventually unlock the exit and move on to the next spot on the adventure board. 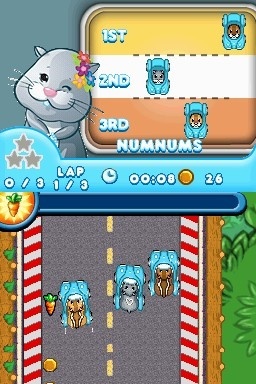 You will jump, slide through twists and turns, pop balloons, destroy crates, pick up carrots and other food goodies so you can dash, and in some cases your hamster will even use a little car, sleigh or hamster ball to move around. 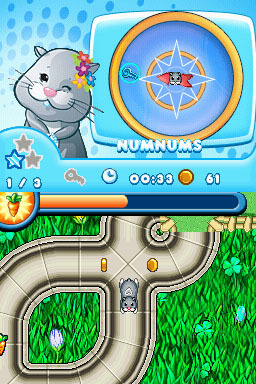 The controls are very simple: you move the stylus across the screen depending on where you want your pet to go, and you use the left trigger to dash. 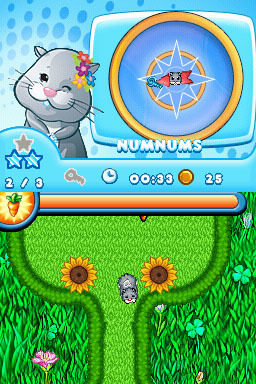 To clear each adventure and unlock the next one you must play and win the final race against the Wild Bunch. 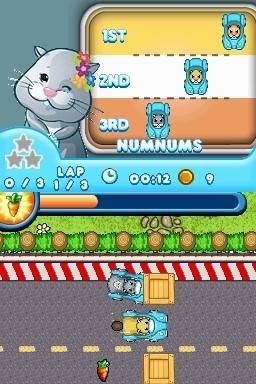 Races are done in the same way, moving the stylus to control your little car. 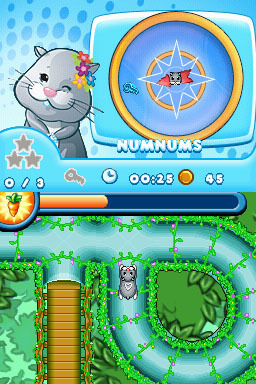 There are collectible items such as coins, food and stars, and you can dash or use the speed ramps for a little speed boost. There are also some shortcuts, but it's too easy to get into one and realize you just got turned around as the other two contestants zoom by you in the opposite direction. 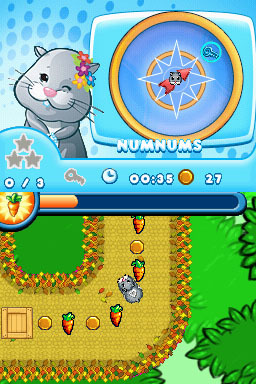 There is also an optional race and a nurturing house in each of the adventure areas. 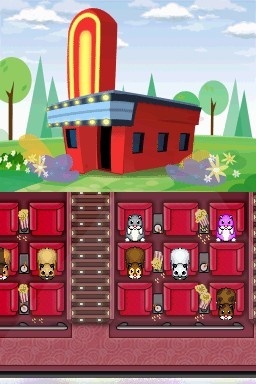 The optional race unlocks after you participate in the final race (the cloud will disappear) and the house will give you other pets to play with. 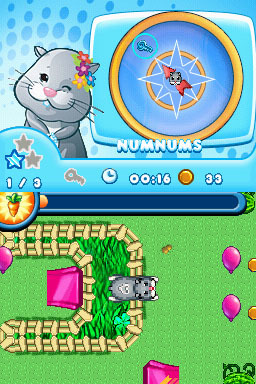 Nurture Mode stages allow you to play with the hamsters. 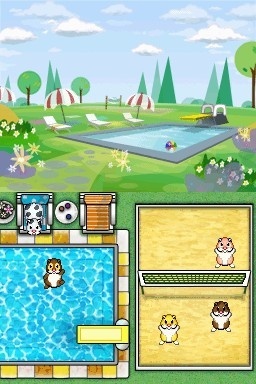 You drag them to the different spots to keep them happy: food, water, washroom (they can use the toilet and bathe in the tub) and hamster wheel for some exercise. 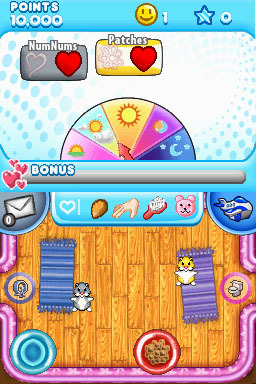 You also have a number of items that you can drag to the pets to keep them entertained: a treat, a brush, a toy and a hand (which pets them). 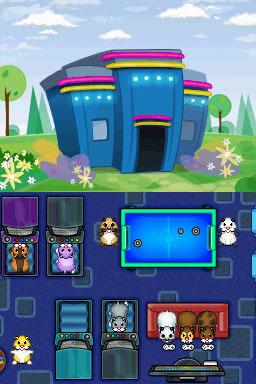 The animations for the different situations are pretty cute to see, as the little guys roll around on the floor hugging a stuffed animal making cute noises, or as one of them sits on the toilet reading a newspaper (yes, they really do!). 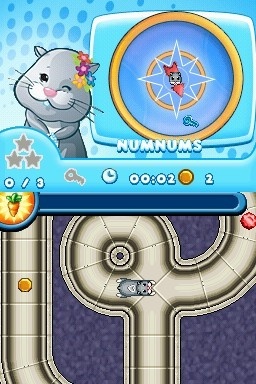 To top it off in the cuteness department, the limited edition of the game comes with a Nutters pet, which I have used to annoy my cats. This little guy moves, spins and makes all kinds of funny noises around the living room floor. In fact, I think it clucked and barked at some point. We love it; the cats, not so much! Unfortunately, the game cartridge doesn't come in an actual Nintendo DS game case, but in a cardboard sleeve instead. Not quite sure why, since there seems to be enough space in the box to fit the entire thing. 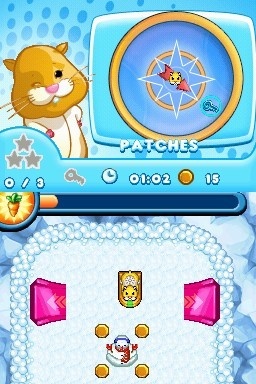 Zhu Zhu Pets 2 may not be extremely challenging or have the latest state-of-the-art graphics, but it's a fairly simple and entertaining adventure/virtual pet game for kids. 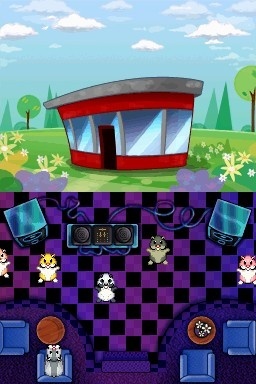 The pets are cute and sound adorable (although sometimes repetitive), the gameplay is very simple and accessible, and everything as far as notes you receive during the adventure and overall game instructions is fully voiced - which is how it should be for every single children-oriented title. Special thanks to Amanda Young and Activision for providing a copy of this title.